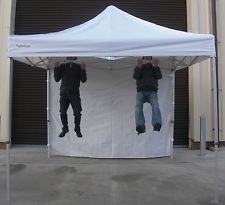 3 X 6 MT INDUSTRIAL POP UP GAZEBO . 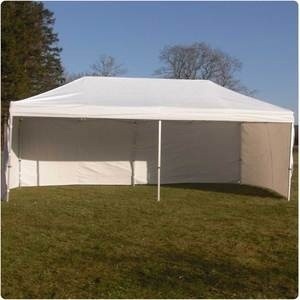 IF YOU REQUIRE THE STRONGEST MOST DEPENDABLE POP UP GAZEBO IN THE MARKET -THIS IS IT ! YOU WON"T HAVE TO REPLACE YOU STRUCTURE EVER AGAIN. 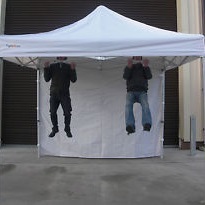 IDEAL FOR EXHIBITIONS,FAIRS , MARKETS IN FACT ALL DOMESTIC AND INDUSTRIAL USE. *NEW REVOLUTIONARY FRAME THAT WON"T CRUMBLE UNDER PRESSURE DUE TO OUR RIBBED SUPPORT STRUCTURE. - *WHEN ONLY THE BEST WILL DO ! 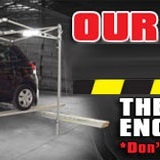 - FOR LESS THAN MOST OF INFERIOR MODELS IN THE MARKET! AMAZING PRICE JUST 645 EURO. *ADD 150 EURO IF SIDES REQUIRED. FEATURES; *STRONEST GAZEBO ON THE PLANET. *NEW GENERATION FRAME. *TOUGH HEAVY DUTY ROOF AND SIDES. *TIE DOWN KIT AND PEGS INCLUDED. *FREE PREMIUM GRADE BAG WITH WHEELS.